Go soft on your bum... so you can play hard. Hard drum throne surfaces can be very uncomfortable and difficult to endure for extended periods of time. 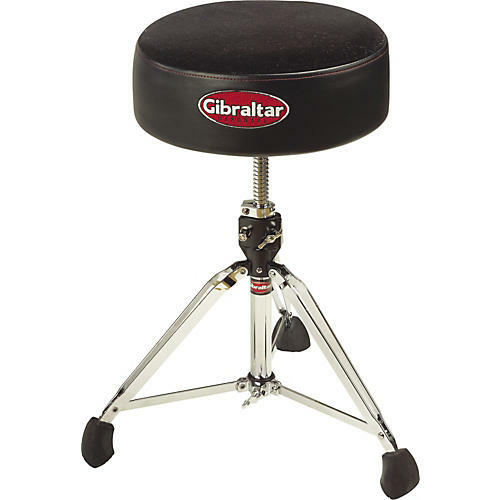 Without solid support and comfort, a drummer's style and creativity can be severely impaired. Gibraltar's Softy Throne incorporates a top-grade 5"-thick cushion and an outer layer of plush Cordura fabric creating a soft and comfortable sitting surface. The Softy seat mounts on a double-braced tripod base with die-cast spindle height adjustment system and Gibraltar's Super Foot solid foundation rubber foot support.